Gimmick watch: which Galaxy S4 features are actually useful? Which will you use and which will you switch off? Is the world's most powerful phone packed with features or gimmicks? Samsung announced an enormous array of software features to be included in the Galaxy S4, but which are tools you will actually use, and which are menu stuffers? We slip on our Gimmick Goggles to find out. Dual Camera: ever taken a photo and wished your own disembodied head could float in the frame with your friends and family. Utilising the front- and back-facing cameras simultaneously, the new Dual Camera feature can achieve just that. Gimmick Goggles rating: 5 stars. This is a classic Samsung "feature", making use of hardware components without really thinking whether the result is something people will really want. The feature makes more sense in the Dual Videocall mode, where you can show both cameras at once during a videocall. This is perfect for boasting about how great your hotel room is to a loved one who is stuck at home with messy kids or smelly pets. Smart scroll: though all the fuss pre-launch was centred on an eye-following tech for scrolling pages, Smart Scroll turned out to be accelerometer-based. You tilt the phone one way to scroll down, and the other to scroll upwards. Gimmick Goggles rating: 4 stars. 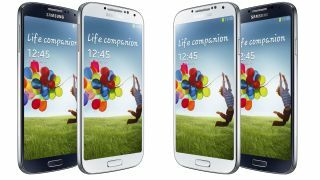 Samsung has a similar feature in the Galaxy S3 and we hated it, mostly because the sensitivity settings were so off the mark. If this has been corrected, maybe we might use it. Otherwise, we'll stick to scroll the öld fashioned" way. S Health: with a batch of new apps and a range of new accessories, the Galaxy S4 is ready to be the personal trainer you love to hate. Gimmick Goggles rating: 2 stars. Had Samsung just pre-installed Endomondo and left it at that, we would have been crying "gimmick" from the rooftops. But, the range of accessories that can be added to the mix leads us to believe that Samsung believes in what it is trying to do with S Health. S Translator: type in words in your own language and have the phone speak them in another language for you. The app supports nine languages, including English, Spanish, German and Chinese. There is even a collection of pre-loaded phrases so you can use it without a data connection. Gimmick Goggles rating: 1 star. This was my first "bravo" moment in the Samsung presentation. Even though you can achieve similar things using apps like Google Translate, this seems like a solid implementation of an important smartphone feature of the future. Air View/Air Gestures: Do you hate touching your touchscreen? Me neither, but Samsung is convinced that the future for touchscreen input is waving your digits just millimeters above the screen. Music tracks can be skipped with a dismissive wave, and your image galleries can be explored by hovering a finger just off the screen. Gimmick Goggles rating: 3.5 stars. These are both gimmicky features, and most people will likely switch them off, though the Air View gallery gesture could be handy from time to time. In the end it depends on how well these gestures work. If they are too sensitive it will become annoying; not sensitive enough and they may as well not be installed. Group Play: So you are hanging out with a gang of Galaxy-toting groupies and you all decide you want to listen to the same song. Group Play lets you share the audio across all the phones at the same time, and divide the sound so that two phones can be a stereo pair, and more (up to 8) can create a surround sound-like experience. Gimmick Goggles rating: 3 stars. Sharing media is always awesome, and if you imagine that a compatible Group Play device isn't just another phone, but a TV or a Samsung stereo, then you can see how this could work. The idea of 8 people making one big boombox out of their phones is totally goofy, though. Sound and Shot: when you take a photo, why not add a little audio? With Sound and Shot you can add a 9-second audio clip to the image in your gallery, immortalising the moment when the photo is taken. Gimmick Goggles rating: 5 stars. You know what the worst part about smartphone videos are? The tinny, wind-blown, screaming audio. So why would you want to add that to a still photo? We much prefer the way HTC approached this, capturing 3-seconds of video, but stripping out the sound. Samsung WatchON: making use of an in-built IR blaster, the Galaxy S4 can be your new universal remote. Gimmick Goggles rating: 1 star. IR blasters should be in everything. Loaves of bread, slippers, cats. Having the Galaxy S4 double as a universal remote just makes us love it more.